These lights in our hearts they tell no lies." Julia is a maddening sort of character. So much so that early on I wanted to throw my hardback copy of Whitney Gardner's novel You're Welcome, Universe as hard as I could. Alas, I was on a United Airlines flight home from an institute on writing at Columbia University Teacher's College, and my flight attendant was already a bit on edge at the plane's PA system going down. So, I read on, and, as I did, I kept feeling myself connecting. Like Julia, I have a chip the size of the whole world on my shoulder sometimes. I can hear but often don't listen. I thought to myself...how hard must it be to listen when you can't hear. Then, I thought about another reason this book bothered me. It felt like there were bits I'd missed, not only due to the gappy dialogue Gardner uses to give us the sense of what it's like to read a speaker (or "hearie's) lips but also due to what seemed like skips and jumps in the narrative itself, moments following moments at seeming random, chapter titles written in symbolic type I still don't always understand. And this is what it's like to be Julia. Capital D-Deaf as a way of life must feel isolated, it must demand that world-weighted chip. 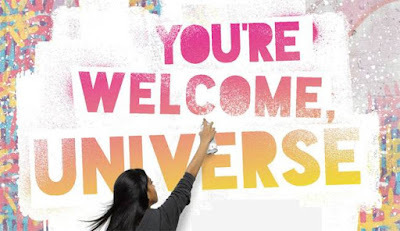 You're Welcome, Universe places its heroine in a world of friendships, fleeting and lasting. The lasting ones revolve around an acceptance of an ultimate question about the nature of the self-expression of art and the wonder of its most effective form: street art. The world of people who want to change the world with art, not to simply show off fancy pieces in art galleries but to push the outside world to see, to listen, to hear. There is a naturally messy teen drama in Julia's story, there is battle with the institutions of home and work and school (parents and jobs and teachers), and there is battle with crushes and heartbreaks and loss of friends and isolation for isolation's sake, moments that make you want to just scream at the characters: Just say what you want to say! But then, they can't. They barely speak each other's language. And the light that shines around you." The definition of "Culture" is, in and of itself, growing and changing and all about intersections. If there is one single moment in this novel that stands out, and now so perfectly finds its way into this Cultural Studies discussion, it is the scene in which Julia's deafness and connection to deaf culture and art culture collides with her awareness of race, sexual orientation, the institution of politics, difference in world view, and her place in the world of fast food. A particular rush on Julia's McDonald's store is spurned on by the arrival of a minivan helmed by "Mrs. Soccer-hockey-tee-ball Mom," who, upon seeing Julia, Indian-American, proclaims "I don't want Muslim hands touching my food! Or the children's." So, there was race culture, the culture of racism. And here is the reaction that speaks to deafness: "Some things I wish I didn't lip read." And then there is a hint at religion, political awareness and sexual orientation discrimination and art combining: "Take your hate to Chik-Fil-A. My only god is Banksy." Of course, it washes down in a hard urban legend of fast food culture, what its employees do with our food when we piss off the already pissed off...like Julia..."...I drop the fries in, but the Band-Aid from my X-Acto slash slides in with them...'Screw her'," says her co-worker, Donovan (59). Here we have identities colliding. We have what Roberta Trites refers to as the "dialogic of differences," or the getting "at the power struggles embedded in a narrative" through "discourse that occur between the Self and Other" (Trites 47). What is most interesting and subversive about this convergence of discourses coming to Julia all at once is that she is indeed deaf. It speaks to the maddening nature of Julia and this novel early on, as I mentioned in my initial reaction, that her deafness leads her discourse between Self and Other to be completely within her and manifest only through general attitude and reaction. Her lack of oral language (and limited communication with "others") becomes a screw the world as it is, and see what I see instead attitude, which, as it happens, is one of the tenets of street art itself, a world in which this novel so firmly places itself. Within the specific discussion of Deaf Culture as specifically related to Street Art Culture in You're Welcome, Universe, it seems that Gardner's intention is to express the idea of "vision as the primary sense" for the deaf. My little sister manages a brewery in the RiNo (River North Arts District) in Denver. There, on every street corner, thoroughfare, and alley-way, some of the most awe-inspiring street art in the country. 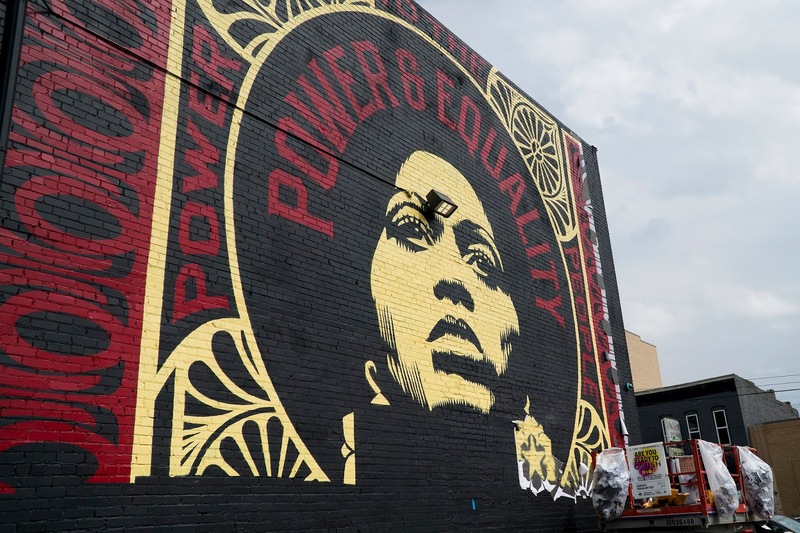 Famous artists of all kinds, including most notably Shepard Fairey (of the Obama "Hope" image fame), who is heavily featured in Banksy's film Exit Through the Gift Shop, have done work there, a place that fully embraces this visual world. Julia should be so lucky to have such a place and almost does. And here is the convergence of these ideas of deafness and visual sense and street art and friendship. YP takes Julia to "5 Pointz," a wall of graffiti in Queens too grand for Julia to even consider putting "anything worthy up there" (183). The illustration of the wall itself on the next two pages is a beautiful example of how Gardner includes Julia's visual world in the narrative, and then, ultimately, on the following page, there is the pain of knowing that this powerful street art is to be demolished for "Luxury Living in the Heart of Queens" (187). 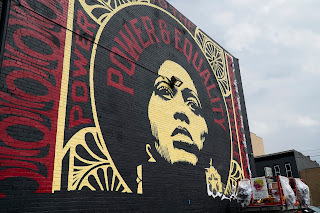 Not only does this scene illustrate the idea of power in the visual but it also brings a true connection between Julia and YP, the height of their early friendship, through their mutual love of street art, a connection that will lead to their falling out. "The Man" taking over the rebellious nature of street art for capitalist gain reminds me of Trites' discussion of Institutional Discourses in Chapter 2 of Disturbing the Universe. Within that also is a reminder of the dominant institutions that seek to shut youths up, an idea that is extrapolated by the fact, in You're Welcome, Universe, that Julia is indeed deaf. Even further than Trites' example from Avi's Nothing But the Truth, Julia "does not always have the capability of accessing the words" she needs to fully understand the world around her (21). This leads to breakdowns in communication, misunderstandings, the falling out she has with YP and her lashing out at both her ESL teacher and her Art teacher, Mr. Katz. With YP, it is Julia's resentment, one that stems from her perception that YP dropped Advanced Art out of pity. While she won't speak in a learning environment, angering her completely inept ESL teacher. She will speak in anger. In her fight with YP, she attends to the idea that she doesn't need pity, that YP is trying to be above her, when she proclaims in her own voice, mocking her best friend, "I know, I'll be the better person and help her out and take a knee so she can go use her magical deaf art powers...like...um...like blind people and music" (210). This is precisely what John Heggestad is saying in his blog post on "(Mis)Labeling Disability" through Stony Brook University's series on Young Adult Literature and Social Justice, that "society expects those with disabilities to try harder--faulting them instead of the society that marginalizes them." For Julia, she already knows how marginalized she is. She sees a lot, but she can't see the difference between the support of a friend and pity. This is something that young people, in general, have to learn. But what if you can't hear? What if you have so little language in terms of communicating as most do? Teens have to learn empathy. For Julia, this means coming to terms with anger and letting her passion for street art blend to those who do can hear and can communicate. She comes to truly connect with YP, not through their shared love of art, but through a blast of empathy delivered to her by Kyle, ex-boyfriend of YP, who Julia misread all along. It comes quite simply, as she reads a note Kyle wrote, exposing YP's truth: "I sit in my car...Thinking about YP, friendless in the art wing. What's so wrong with that? Being alone isn't so bad" (263). That's a shot of truth. This is the elimination of that giant chip on Julia's shoulder I spoke of in my initial reaction. She had to learn this, and thus she develops as a young adult. It stands to note that here, once more, is another example also of what Trites' gets wrong about parents in Chapter 3 of Disturbing the Universe, that "parent-figures in YA novels usually serve more as sources of conflict that as sources of support" (Trites 56). Trites' text must be showing its age in this regard because so many of these modern YA titles we are reading feature great parents, parents who understand and embed empathy in their children. Julia talks to Mee, one of her two mothers, apologizing for all the trouble she's caused. Mee's reaction is so fully beautiful: "You're sixteen. It's to be expected" (289). Yes. It is to be expected. It is expected that any teenager will struggle to react appropriately in the face of so many conflicting "cultural" influences and identities. It is even more expected that a young person with a disability is no different. Julia is not mad because she is deaf. She is mad because she is a teenager, and, like most teenagers, simply struggles to communicate with understanding and empathy.